Jeanne Kuhns has been recording Blood Roots, an album of nostalgic covers, with guitarist George Sawyn at Hans Christian’s Studio 330 in Sturgeon Bay this winter. Kuhns’ earliest musical heroes included Joni Mitchell, Tom Paxton, Joan Baez, Buffy Sainte-Marie, Etta James and Bob Dylan, and later influencers such as Eric Clapton, the Beatles and Bonnie Raitt all stirred her love of songwriting and singing. She said she is also strongly impressed by the contemporary singer/songwriters she knows. Kuhns’ original music has evolved into her own brand of progressive folk. This CD also references even earlier influences: listening to ’40s and ’50s music that her Dad and Mom played on their high-end stereo, selections they loved to dance to and music heard during family excursions to Chicago’s Old Town School of Folk Music and other Chicago listening rooms, where they discovered up-and-coming folk musicians. “I wanted to make a CD for my mom, who had just moved in with me due to health problems. She loved my original stuff, but whenever George and I would practice certain covers from her younger years, she would close her eyes and revel in the memories the music would bring,” Kuhns said. Jeanne Kuhns sings during a Lost Mothra record-release party in 2012. Photo by Len Villano. Having already recorded six albums, including some with a previous band, Lost Mothra; and her current band, Small Forest, as well as a holiday collection — most of which feature the guitar stylings of George Sawyn — Kuhns set out to start a new project in 2016. 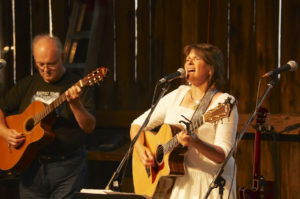 Sawyn comes from a background of playing in wedding bands in Chicago for more than 38 years and is influenced by a multitude of masterful musicians from Chet Atkins, Montgomery, Towner and Bertoncini and jazz pianist Marian McPartland to classical guitarists John Williams and Andrew York. Sawyn is a familiar instrumentalist at fine Door County establishments and events, and he has played with many Door County musicians. As a long-term project that started two years ago and advanced as funds became available, Blood Roots required all funding patrons to remain patient — something that Kuhns greatly appreciates. She and Sawyn decided to record the album very sparsely — using just his guitar to create beautiful leads and instrumental sections to complement Kuhns’ soulful, gentle, yet powerful voice — to strive for a kind of low-key meditation on the nostalgia that music brings to us. Hans Christian added a cello and bass on two songs. “It was a joy to bring home the songs we had recorded for the day and see my mother’s reactions to them,” Kuhns said. Since the completion of the album, Kuhns’ mother has passed on, “into the sparkling stars of the universe.” Now, even though her mother is gone, Kuhns knows she has Jo’s stamp of approval on the project that was created in her honor. Its name, Blood Roots, is a nod to one of her mother’s favorite flowers and to the musical roots of Kuhns’ childhood. 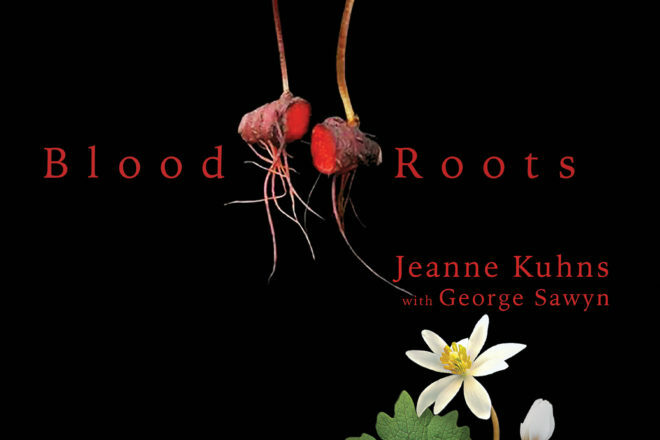 Jeanne Kuhns and George Sawyn will officially release Blood Roots during an intimate concert in the Door Community Auditorium’s (DCA) Fireside Lobby on Feb. 14 at 7 pm. Tickets for the concert are $17.50 per person, and advance reservations are recommended. The DCA box office, at 3926 Hwy 42 in Fish Creek, is open Monday through Friday, 12-5 pm. For more information, call 920.868.2728 or visit dcauditorium.org.